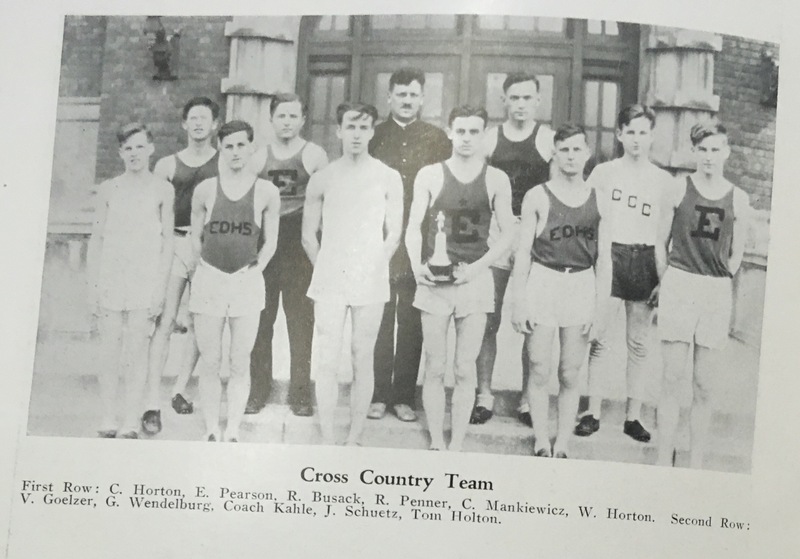 Riverside 1914 cross country state championship team. 1915 state runner-up and 1916 state champion John Roberts is seated at far right. Senior picture of 1915 state champion and 1916 state runner-up Kenneth Head. He was injured in World War 1 but survived. His family continues to live in the North Shore area. 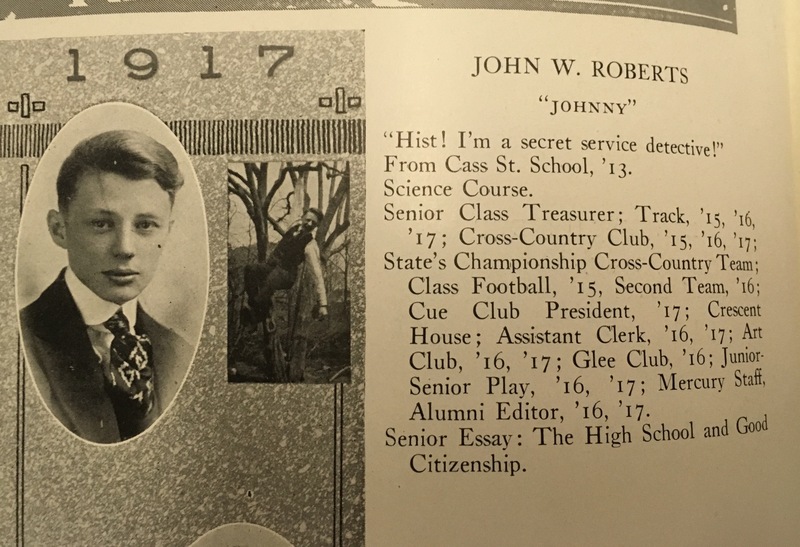 Senior picture of 1916 state cross country champion and 1917 state mile run champion John Roberts. 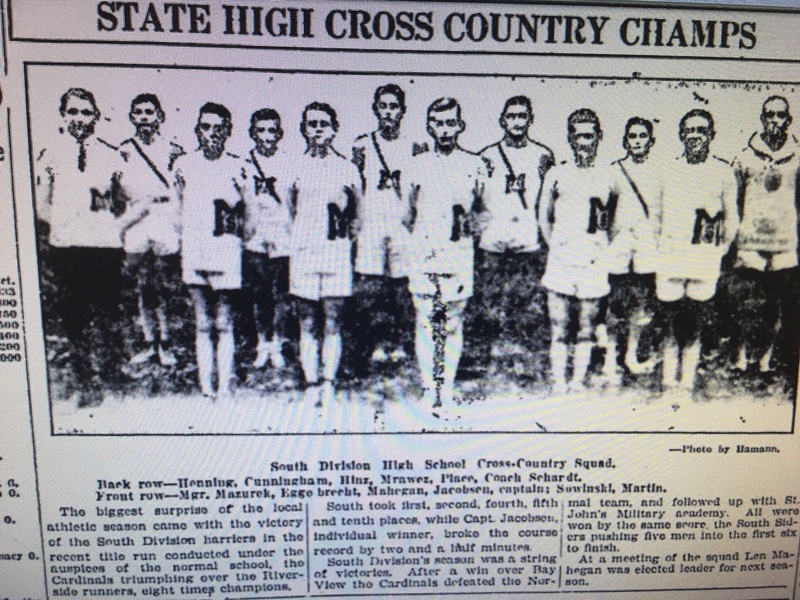 Riverside’s 1919 state championship cross country team. Individual state champion Raymond Arndt is standing at far right in what looks like boots. James Hassenmiller and Robert Henckel were each part of three state championship teams. Senior picture of 1919 individual state champion Raymond Arndt. 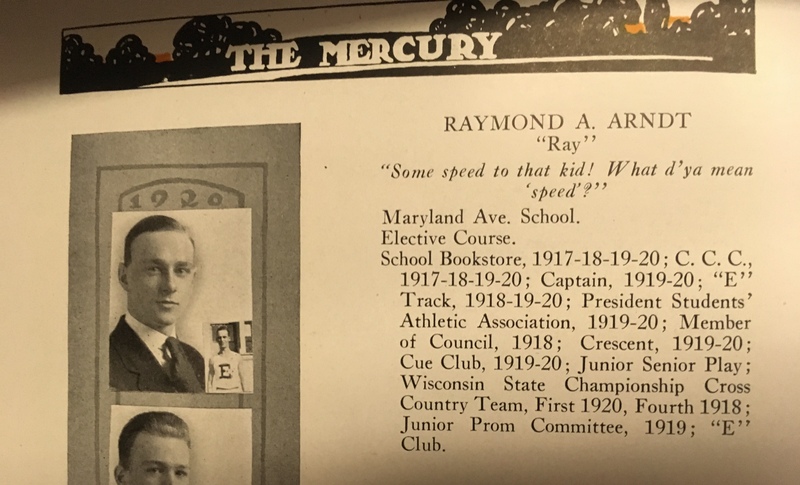 He was also state runner-up in the mile run in 1919, and state champion in 1920. Arndt competed at Michigan where he was part of the 1922 Big Ten CC championship team, and the 1923 NCAA National Championship track team. 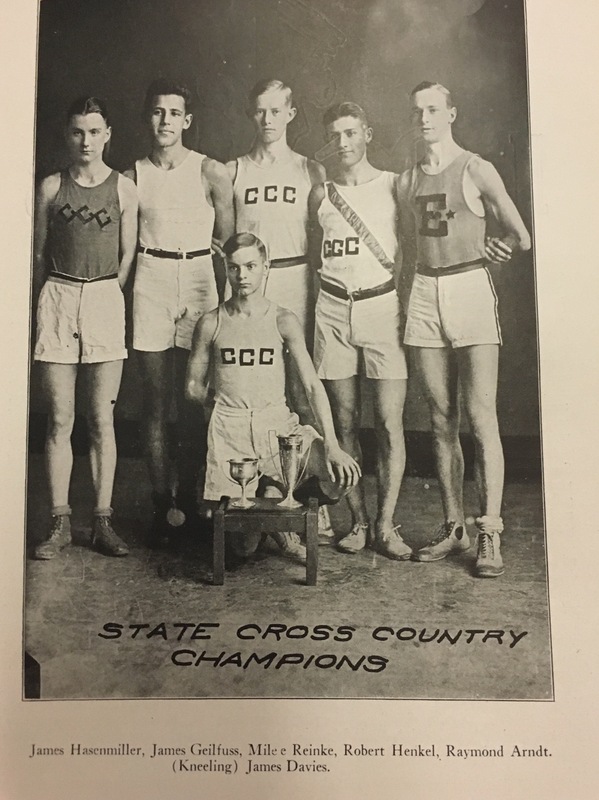 Riverside’s 1920 cross country state championship team. Individual champion Leroy Grossman is seated at the far right. 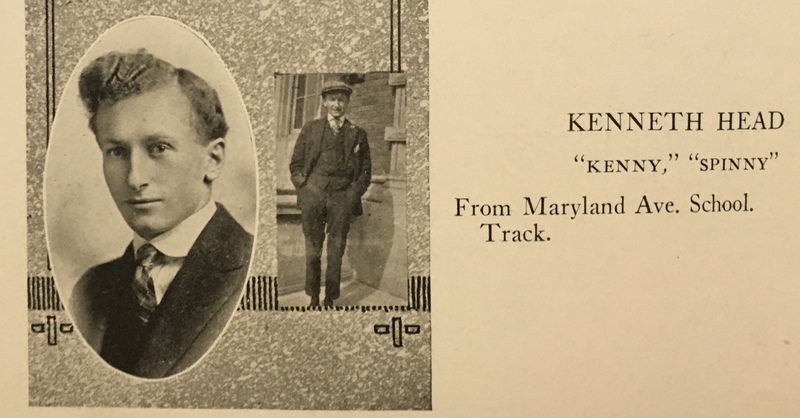 This was the only year he ran CC but was also the state mile run champion in 1922. He attended Harvard but did not compete there. Coach Charles Kahle is standing second from left. Milwaukee Journal picture from the 1917 state meet in the snow at UWM. No particular runner is labeled, but the individual state champion was Cyril Buckett from Milwaukee South. Team pictures of 1921 state cross country champions Milwaukee South, the first team other than Riverside to win the state title. Individual state champion Henry Jacobsen is front and center. To the left of him is state runner-up Leonard Mahegan. Coach Arlie Schardt is standing at the far right, looking like a stereotypical gym teacher. Here he is a little over a year removed from winning his Olympic gold medal. 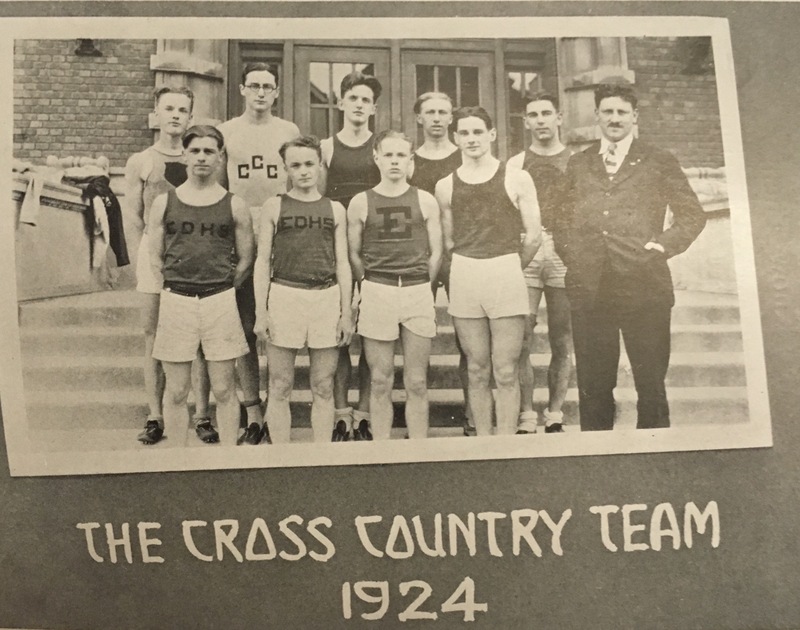 Riverside’s 1924 cross country state championship team. In the middle of the front row with the E on his Jersey is individual state champion Ernest Wright. He won the title as a freshman, when pretty much every school except for Riverside didn’t allow freshmen to run on varsity. He was also state mile run champion in 1926. 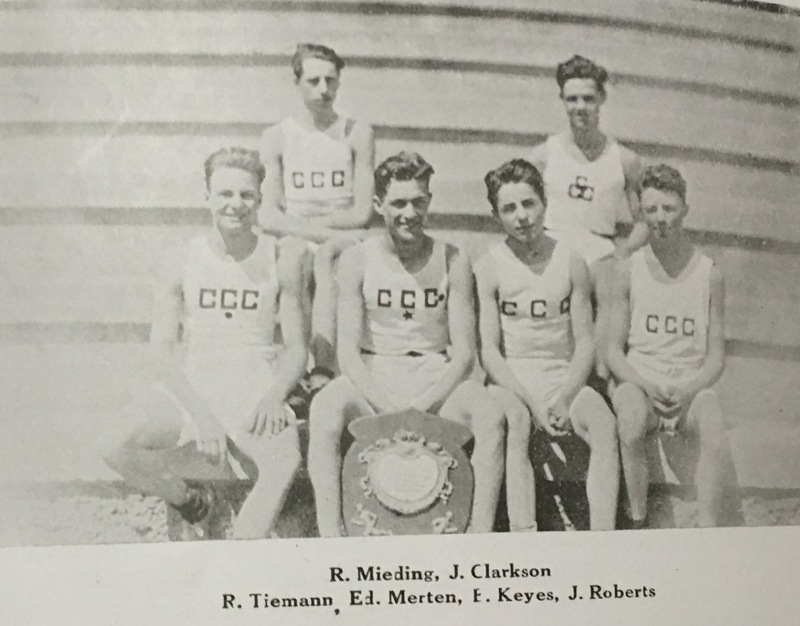 Riverside’s 1926 cross country state championship team. Standing front and center is individual state champion Albert Folsom. To the right next to him is individual runner-up Ernest Wright. After winning state as a freshman, Wright took 2nd in the 1925 meet to John Brown of Racine, being out sprinted at the line. The result was similar again this year with Folsom out kicking him right at the line. being the first three-time individual state champion. Coach Charles Kahle is seated at the far right. 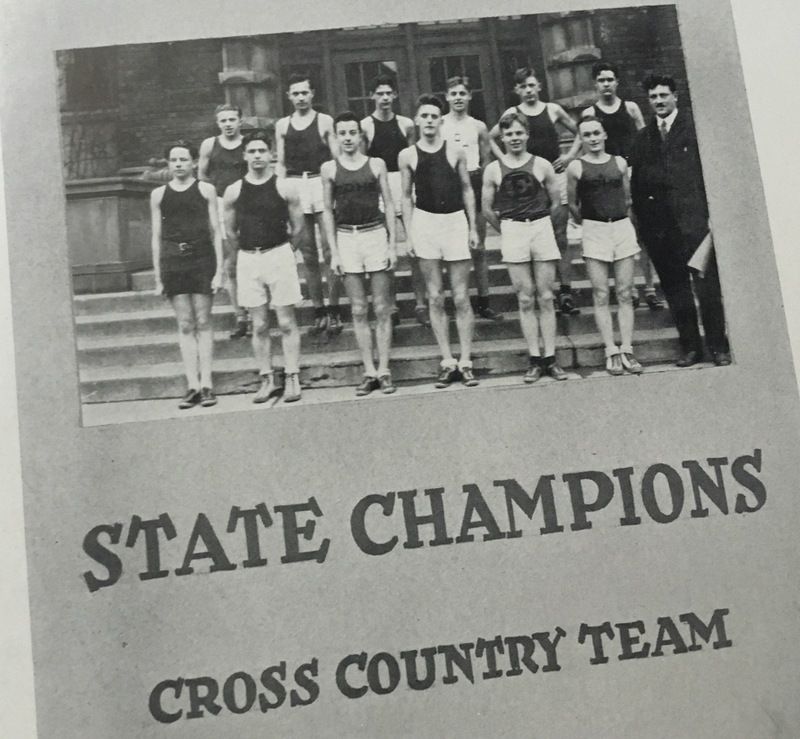 Riverside’s 1928 state championship cross country team. A true team effort, their top finisher was George Wendelburg in 5th place. 1929 individual state champion Orville O’ Neill of Manitowoc. He took 4th place as a sophomore in 1928. 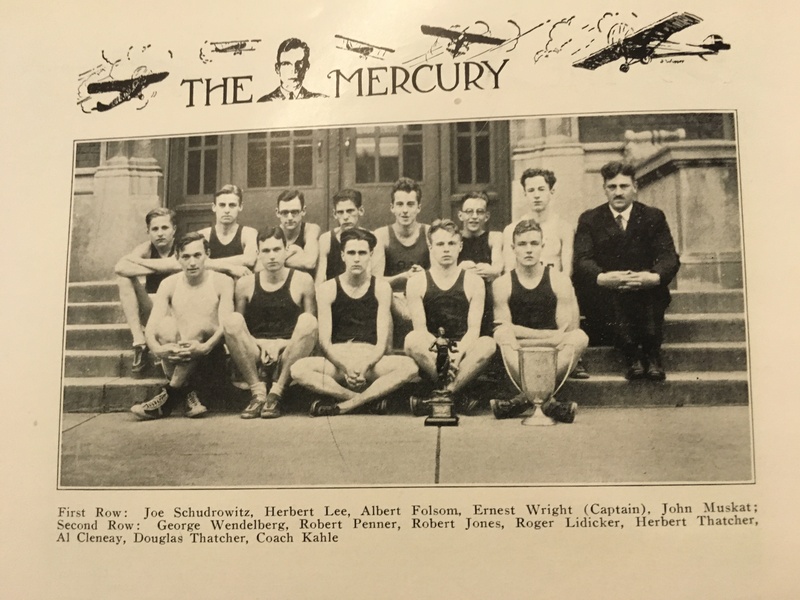 O’Neill was the first individual champion from outside of southeast Wisconsin, and his 1929 Manitowoc squad was the first team aside from Riverside and South to win the state title. Orville O’Neill of Manitowoc repeats as individual state champion in 1930. He would go on to be state champion in the mile run in 1931. Orville O’Neill competing for Marquette University in 1932 or 1933.
run champion in 1932. The Shorewood dynasty starts here! These are all amazing finds and thank you for sharing! The running sports here go beyond the screen and become a window in to many different things. 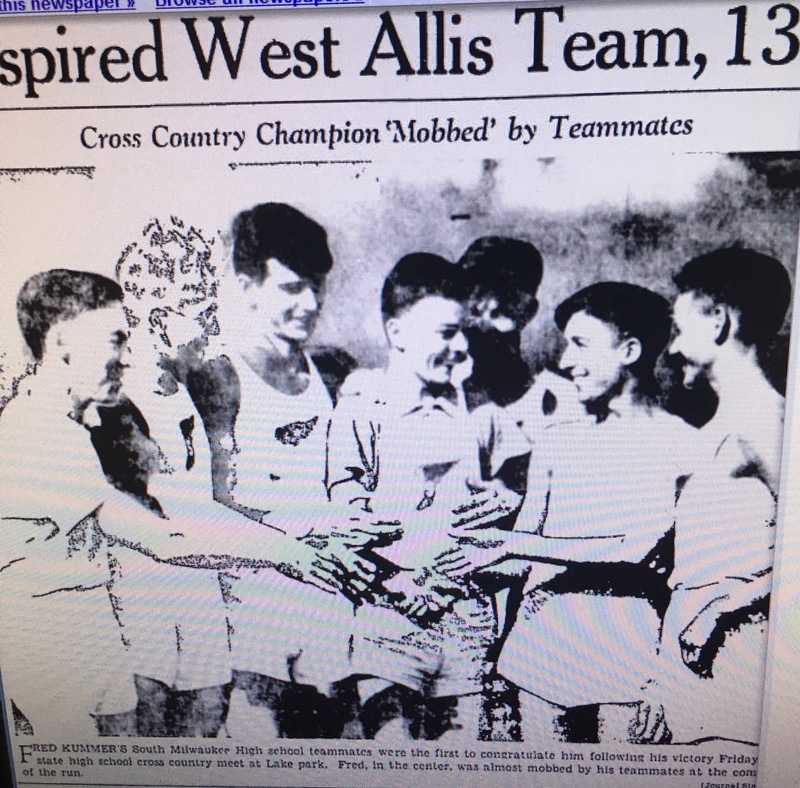 Fritz Kummer wins his first state title in 1936. He is the short one in the middle wearing what appears to be a hoodie. Kummer was 6th in the 1935 meet. He would win the individual title again in 1937, along with leading South Milwaukee to their first team championship. 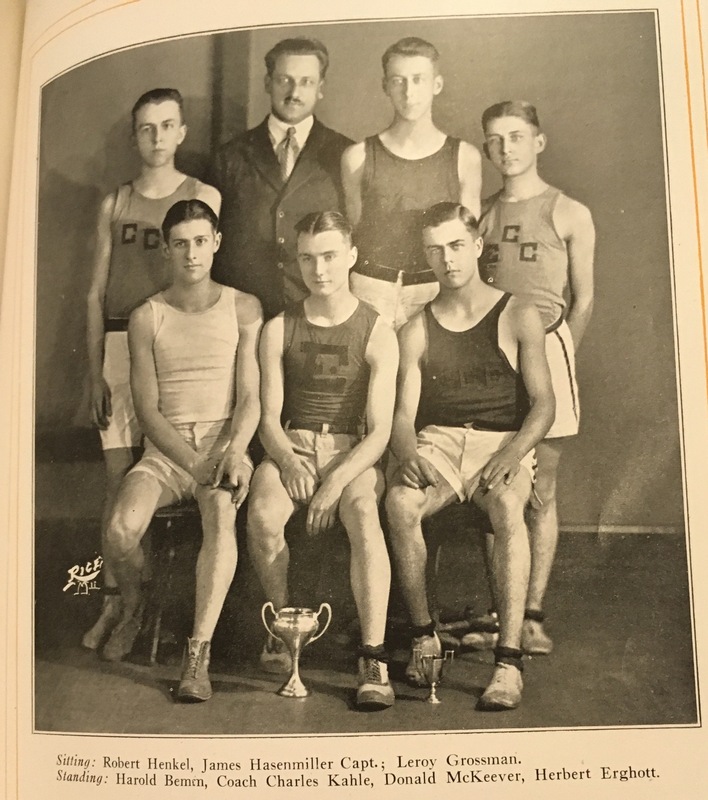 Kummer would be state champion in be mile run (Class B) in 1937 and 1938. The (first) South Milwaukee dynasty starts here! @zen. I DO wonder…also, although he did not make any of these pics, there was a guy running for Riverside in the Class of ‘17 whose last name was Wilhelmy. 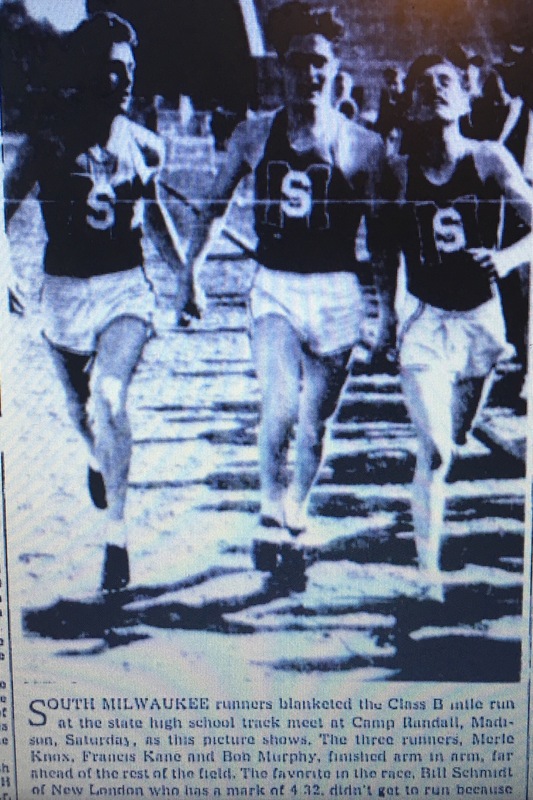 Merle Knox, Francis Kane, and Bob Murphy of South Milwaukee go 1-2-3 in the 1939 Class B state Mile Run.